License Plate Recognition cameras or License Plate Reader (LPR) cameras are cameras manufactured with hardware and software technology that compensates for vehicles moving at high rates of speed, headlight glare and the reflective material that license plates are made of in some countries and states. 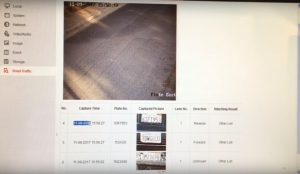 Beware, some integrators may use the term LPC or License Plate Capture cameras and use a standard HD CCTV camera to take a human readable picture or video of plates, where a human operator can discern plate details. This generally means mounting and configuring standard HD surveillance cameras in the best possible manner to see license plates, but it is not the best solution available. Non-LPR cameras will still produce somewhat readable plates for parked vehicles within a certain distance during the day time if mounted properly but generally the lighting emitted from the sun during the day or a vehicle’s lights at night will produce washed out or un-readable plates. 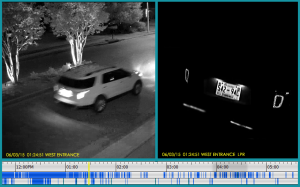 This image shows how a true LPR camera compares to a standard HD CCTV camera when trying to capture the license plates of a moving vehicle at night. As you can see in this side by side comparison, the license plates of the moving vehicles are blurry when captured by a standard HD security camera, but the LPR camera is able to compensate for the vehicle’s speed and captures the license plate clearly. Also, when you compare the light glare from the headlights and tail lights of the cars you can see that the LPR camera image is much clearer. Successful license plate recognition not only requires selecting a good LPR camera and the correct focal lens but equally important is proper planning of the camera’s placement and configuration after installation. Height, vertical angle, horizontal angle and distance from subject vehicles all come into play when choosing where to mount a LPR camera. Direct sunlight can also distort a picture so an auto-IRS camera is recommended. Once installed, the LPR camera will likely require several hours of setup, configuration and testing to fine tune the recognition accuracy. The detection area must be configured using a captured plate, measuring the pixels consumed and configuring the camera. Depending on the maximum vehicle speed, the LPR camera’s exposure time, gain, IRS mode, focus mode among many other options must be configured prior to day light testing. Finally, the camera must be tested and reconfigured during the nighttime hours to ensure a proper installation. Our Clear IT Security LPR cameras also support Automatic number-plate recognition (ANPR); a technology that uses optical character recognition on images to read vehicle registration plates. Automatic number plate recognition can be used to store the images captured by the cameras as well as the text from the license plate. This feature can allow for text searchable logging of license plates along with a picture, detection date/time, direction of travel and lane #. White/black listing of license plates along with automatic gate opening, alarms, notifications and partial plate # searches are possible. ANPR technology however is not perfect and should not be relied on as the only source of plate capture. Due to many factors including dirty plates, plates out of place, reflective sprays, missing plates and temporary or paper plates OCR capture result accuracy is typically around 7-8 of out 10. Manual video review may be necessary when plates are not found in the database. While costs have come down somewhat over the years, a true LPR and ANPR camera costs at least twice, if not 3-4x more (or higher) than a standard CCTV camera. Advanced ANPR functions and solutions require additional software licensing costs as well.